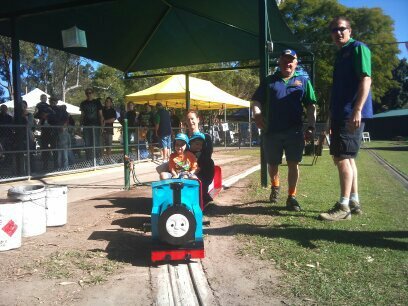 The fourth Sunday of every month often finds us at Bracken Ridge for a ride - or several - on one of the mini trains chugging around the park. There are both steam and electric trains and each one is different. You can see them all going by from your spot in the queue.There are plenty of people waiting with cameras in hand and others waving to the passing trains while waiting for their turn. If you are watching the station and a steam train pulls in you may get to see the driver filling up with coal and water.One of the favourite trains is a Thomas the Tank Engine look alike. Some of the trains carry quite a few passengers while others take only about four. Because of limited space the queue can get rather long on some weekends. The ride itself goes for a few minutes and may be one or two laps of the circuit depending on the queue. Younger children do need an adult riding with them for safety. There is also a requirement for closed shoes. Tickets are a bargain. You can purchase ten for $10 or single rides for $2. Once you've had a train ride grab a sausage in bread, a drink or doughnut. There is also an assortment of other stalls depending on the day. They including a bit of trash and treasure, kids novelties, plants and lollies. The adjoining playground is pretty popular as well. The trains are run and maintained by the Bracken Ridge Lions Club. All money raised goes back into the community by way of the club.The members also act as drivers, ticket sellers, train fixers and stationmaster on the day. For those with a mechanical bent there is always some sort of work being carried out on the trains. For a birthday party with a difference a train party is ideal. Contact the Lions Club for details. Contact details are on their website at Bracken Ridge Central Lions Club. They will even supply a marquee. There are picnic tables and decent toilet facilities to help your day run smoothly. Keep up to date with upcoming train days and other activites on the Lions Club website. 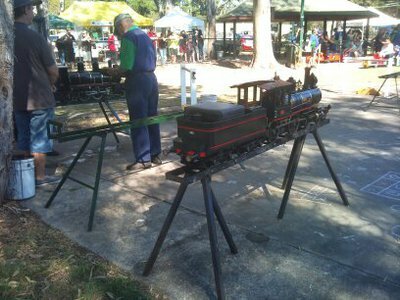 your info about train rides at mcpherson park bracken ridge is incorrect. sun 29th june. no trains!